Getting your toddler off nappies can be difficult, but with the following potty and toilet training tips you could help your little one to make an easy transition from nappies to the toilet. Rather than just taking the nappy away and sitting your child on the potty, explain the change that is about to come and why it needs to happen. Explain that it will be hard and that you will need your child to try hard. Show your child how to use the potty. Sit down on the loo yourself and have a wee then wipe. Do this several times in front of your child. While you might let your child wear nappies at night or when you are out during the beginning of the potty training period, make sure that you are consistent with how you handle using the potty in the periods where your child does not have a nappy on. Do not lose your temper or become angry when your child has an accident. You do not want to make the potty training process a stressful one for you or your child as this will hinder their progress. 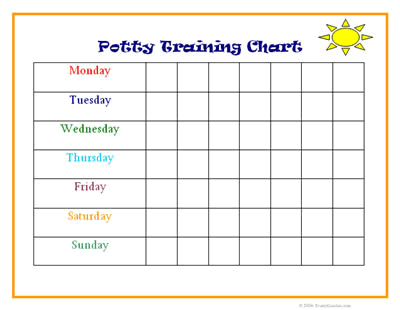 There are many ways to make the potty training experience fun, easy and stress free. The below tips and tricks will help to make the potty training process a lot more fun. The following are some helpful tricks from parents who have had experience potty training and had a successful process. Invent a praise song that you and your child can sing together when he or she is using the potty successfully. Buy a potty that either sings a song, changes colour or has a reaction when a child uses it successfully. Some potties have shapes that morph into other shapes (for example, a circle changes into a star) when the child uses them successfully. Add blue or red food colouring to the toilet water, when the child urinates the water will change colour to either green or orange, making the process much more fun. Buy some inexpensive toys, stickers or a box of your child’s favourite biscuits and reward the child every time he or she uses the potty successfully. Put plastic down over all surfaces and take the nappies away. Clean ups will be quick and easy. Use the right clothes to make getting to the potty as easy as possible. Put girls in dresses and boys in pants with elastic bands that pull of easily. Children generally love flushing the toilet. However, most are told that they are not allowed to do this. Use flushing as a treat. If the child goes in the potty successfully, empty the contents and allow your child to flush away the contents. Give a lot of positive feedback when your child uses the potty successfully. Remember to smile, clap, sing and tell your toddler that he or she is very clever and good. The most important thing in your child’s life is your approval. Shower them with affection and joy if they use the potty successfully. Allow your child to choose some books that he or she really likes and only read them on the potty. Alternatively, you could allow your child to buy a new toy and only play with it on the potty or after using it successfully.